This all-star, easy to follow recipe for Mushroom Stuffed Chicken Breast will sure to impress any dinner guests – from toddlers to adults. These elegant chicken breasts, stuffed with mushrooms and spinach, are great for all phases of the Ideal Protein program. Try it out and let us know what you think! Season chicken with paprika, salt, and white pepper. 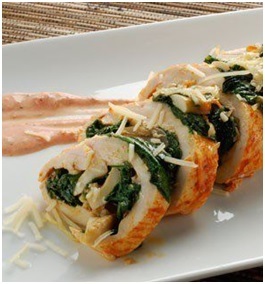 Place spinach, and mushrooms onto chicken breast and roll. Bake in 300˚ oven until the internal temperature reaches 155˚. Serve with WF Tomato Basil Sauce. Take control of your happiness…you deserve it. Join us Tuesday, November 4 at 5:30 p.m. for BRIO’s Free Ideal Protein Seminar and find out how you can lose weight safely and effectively. Let BRIO’s expert nutritionists guide you on your journey to greatness. Simply call 841-0150 to reserve your spot. Refer a friend to join the IP program and you receive a $50 IP Product credit. We look forward to seeing you there! For more information about Ideal Protein, contact us today!